Match ends, Sky Blue 1, Portland Thorns 3. Second Half ends, Sky Blue 1, Portland Thorns 3. Attempt missed. Hayley Raso (Portland Thorns) right footed shot from the right side of the box misses to the left. Substitution, Portland Thorns. Kathryn Williamson replaces Meghan Klingenberg. Tobin Heath (Portland Thorns) wins a free kick in the defensive half. Attempt missed. Allie Long (Portland Thorns) right footed shot from outside the box is too high. Assisted by Lindsey Horan. Attempt blocked. Samantha Kerr (Sky Blue) right footed shot from the right side of the box is blocked. Assisted by Kelley O'Hara. Goal! Sky Blue 1, Portland Thorns 3. Allie Long (Portland Thorns) right footed shot from the centre of the box to the top left corner. Assisted by Hayley Raso with a cross. Substitution, Portland Thorns. Hayley Raso replaces Christine Sinclair. Substitution, Sky Blue. Shawna Gordon replaces Natasha Kai. Corner, Portland Thorns. Conceded by Erin Simon. Caroline Casey (Sky Blue) wins a free kick in the defensive half. Attempt missed. 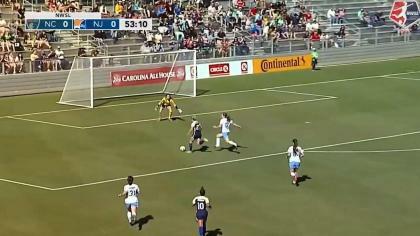 Nikki Stanton (Sky Blue) right footed shot from outside the box is close, but misses to the left. Assisted by Kelley O'Hara. Corner, Portland Thorns. Conceded by Christie Rampone. Offside, Sky Blue. Kristin Grubka tries a through ball, but Leah Galton is caught offside. Foul by Dagny Brynjarsdottir (Portland Thorns). Corner, Sky Blue. Conceded by Emily Sonnett. Attempt blocked. Samantha Kerr (Sky Blue) left footed shot from the centre of the box is blocked. Assisted by Raquel Rodríguez. Substitution, Portland Thorns. Dagny Brynjarsdottir replaces Nadia Nadim. Delay in match Natasha Kai (Sky Blue) because of an injury. Attempt saved. Samantha Kerr (Sky Blue) right footed shot from the centre of the box is saved in the centre of the goal. Assisted by Raquel Rodríguez. Offside, Sky Blue. Kristin Grubka tries a through ball, but Natasha Kai is caught offside. Kristin Grubka (Sky Blue) is shown the yellow card for a bad foul. Goal! Sky Blue 1, Portland Thorns 2. Lindsey Horan (Portland Thorns) header from the centre of the box to the top right corner. Assisted by Nadia Nadim with a cross. Corner, Sky Blue. Conceded by Michelle Betos. Attempt missed. Nadia Nadim (Portland Thorns) right footed shot from the right side of the box misses to the left. Assisted by Christine Sinclair with a through ball. Attempt missed. Raquel Rodríguez (Sky Blue) right footed shot from the centre of the box is high and wide to the right. Attempt blocked. Samantha Kerr (Sky Blue) right footed shot from the centre of the box is blocked. Assisted by Natasha Kai with a headed pass. Delay in match Christine Sinclair (Portland Thorns) because of an injury. Second Half begins Sky Blue 1, Portland Thorns 1. First Half ends, Sky Blue 1, Portland Thorns 1. Attempt saved. Tobin Heath (Portland Thorns) right footed shot from outside the box is saved in the centre of the goal. Attempt missed. Tobin Heath (Portland Thorns) right footed shot from outside the box is close, but misses to the left. Goal! Sky Blue 1, Portland Thorns 1. Allie Long (Portland Thorns) header from the centre of the box to the centre of the goal. Assisted by Tobin Heath with a cross following a set piece situation. Amandine Henry (Portland Thorns) wins a free kick on the left wing. Attempt missed. Christine Sinclair (Portland Thorns) left footed shot from the centre of the box is high and wide to the left. Offside, Portland Thorns. Meghan Klingenberg tries a through ball, but Nadia Nadim is caught offside. Kelley O'Hara (Sky Blue) wins a free kick on the left wing. Offside, Portland Thorns. Katherine Reynolds tries a through ball, but Nadia Nadim is caught offside. Offside, Sky Blue. Raquel Rodríguez tries a through ball, but Natasha Kai is caught offside. Offside, Portland Thorns. Tobin Heath tries a through ball, but Christine Sinclair is caught offside. Nadia Nadim (Portland Thorns) wins a free kick in the attacking half. Attempt missed. Nadia Nadim (Portland Thorns) right footed shot from the right side of the box is high and wide to the left. Assisted by Amandine Henry. Offside, Sky Blue. Kelley O'Hara tries a through ball, but Natasha Kai is caught offside. Attempt saved. Christine Sinclair (Portland Thorns) header from the centre of the box is saved in the top centre of the goal. Assisted by Meghan Klingenberg with a cross. Attempt blocked. Lindsey Horan (Portland Thorns) right footed shot from the centre of the box is blocked. Assisted by Tobin Heath. Attempt saved. 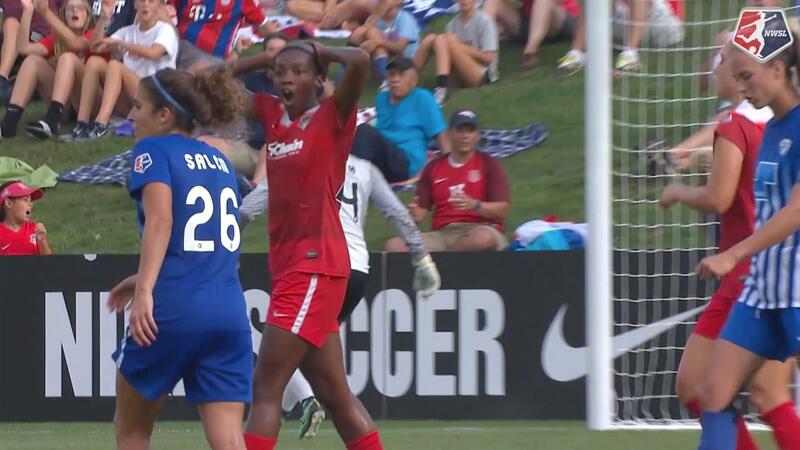 Lindsey Horan (Portland Thorns) right footed shot from outside the box is saved in the bottom right corner. Assisted by Amandine Henry. Goal! 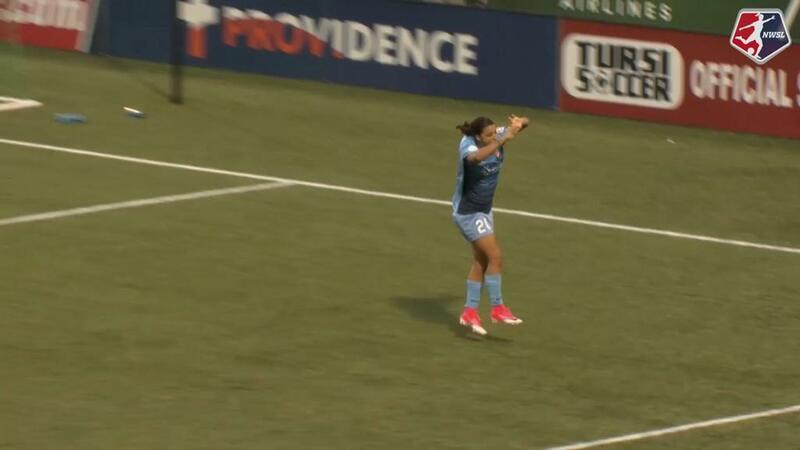 Sky Blue 1, Portland Thorns 0. Natasha Kai (Sky Blue) header from the left side of the six yard box to the centre of the goal. Assisted by Kelley O'Hara with a cross following a corner. Corner, Sky Blue. Conceded by Katherine Reynolds. Offside, Sky Blue. Christie Rampone tries a through ball, but Samantha Kerr is caught offside. Offside, Portland Thorns. Allie Long tries a through ball, but Emily Sonnett is caught offside. Corner, Portland Thorns. Conceded by Erica Skroski. Offside, Sky Blue. Erin Simon tries a through ball, but Samantha Kerr is caught offside.